At a time when most animal rights organizations are actively promoting, advocating and rewarding "humane" animal products and farming methods, I am writing to you on behalf of three of the recipients of that mercy. To the industry, they are known as production units #6, #35, and #67,595. 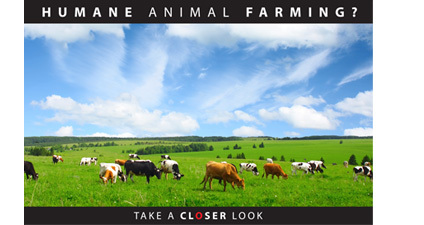 To the "compassionate" consumer, they are known as feel-good labels: "organic dairy", "rose veal", "free-range eggs". To welfare advocates, they are known as "humane alternatives". To each other, they are known as mother, son, sister, friend. To themselves, they are simply what you and I are to ourselves: a self-aware, self-contained world of subjective experiences, feelings, fears, memories – someone with the absolute certainty that his or her life is worth living. #6, is a first time mother. She is frantic. Her baby is missing. She is pacing desperately up and down the paddock, bellowing and crying, and calling for her lost boy, fearing the worst, having her fears confirmed. She is one of the thousands of defenseless females born into a quaint, verdant, organic dairy farm. She will spend her entire short life grieving the loss of baby after baby. She will be milked relentlessly through repeated cycles of pregnancies and bereavements. Her only experience of motherhood will be that of a mother's worst loss. In the prime of her life, her body will give, her spirit will break, her milk "production" will decline, and she will be sent to a horrifying slaughter, along with other grieving, defeated, "spent" mothers like herself. She is the face of organic milk. #35 is a two-days old baby, his umbilical chord is still attached, his coat is still slick with birth fluids, his eyes are unfocused, his legs, wobbly. He is crying pitifully for his mother. No one answers. He will live his entire short life an orphan, his only experience of mother love will be one of yearning for it, his only experience of emotional connection, one of absence. Soon, the memory of his mother, her face, her voice, her scent, will fade, but the painful, irrepressible longing for her warmth will still be there. At four months old, he and other orphans like himself will be corralled into trucks and hauled to slaughter. As he will be dragged onto the killing floor, he will still be looking for his mother, still desperately needing her nurturing presence, especially at that dark time when he will be frightened and needing her more than ever in the midst of the terrible sights, and sounds, and scents of death all around him and, in his despair, in his want for a shred of consolation and protection, he, like most baby calves, will try to suckle the fingers of his killers. He is the face of the "rose" veal we are encouraging "responsible restaurant leaders" to use. 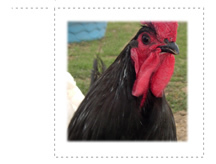 #67,595 is one of the 80,000 birds in a family-owned "free-range" egg facility. She has never seen the sun, or felt the grass under her feet, she has never met her mother. Her eyes are burning with the sting of ammonia fumes, her featherless body is covered with bruises and abrasions, her bones are brittle from the constant drain of egg production, her severed beak is throbbing in pain. She is exhausted, depleted and defeated. After a lifetime of social, psychological, emotional, physical deprivation, she copes by pecking neurotically at phantom targets for hours on end. She is two years old and her life is over. Her egg production has declined, and she will be disposed of by the cheapest means possible – she will be gassed along with the other 80,000 birds in her community. It will take three full work days to finish the job. For two long days, she will hear the sounds and breathe the smells of her sisters being killed in the gas drums outside her shed. On the third day, it will be her turn. She will be grabbed by the legs and taken outdoors for the first time in her life and, like every single one of the 80,000 "spent" hens, like every single one of the 50 billion annual victims of our appetite, she will fight to go on living, and she will accept no explanation and no justification for being robbed of her pathetic only life. She is the face of the "free-range" eggs we are encouraging college campuses, businesses and consumers to use. These are the "beneficiaries" of the "humane farming practices" that we, the animals' defenders, are developing, promoting, and publicly rewarding by encouraging "compassionate" consumers to buy the products of what we know to be nothing but misery. "Humane" practices that, if any of us were forced to endure, none of us would experience as humane. We, the activists, know that there is no such thing as compassionate, responsible or ethical farming on any scale. We know that the only humane and ethical alternative is vegan living. Why are so few of us telling the truth? Why are we describing "free-range" products as "humane" when we know the horror such practices inflict on their victims? Why are we lying to the public, and ourselves, that "compassionate" animal farming is anything but a myth, a marketing scheme, a deceptive label? Why are so many of us offering up the lives of animals by encouraging the consumption of their flesh, eggs and milk, when our only duty is to fight for their lives as if they were our own? Why are we promoting the practice of consuming animals when we know it to be brutal, inexcusable, unconscionable and completely unnecessary? Why are we rewarding consumers for demanding more of the the very thing we are struggling to eliminate? Why are we strengthening and rewarding the worlds' entrenched speciesist assumptions, when our job, our only job, as vegan educators and activists, is to challenge and change those assumptions by offering a new model of thinking about nonhuman animals, a new model of interacting with them, a new practice of living, a new way of being in the world? Many of us justify our endorsement of "humane" animal products and our pursuit of welfare reforms by saying that the world is not ready to change, that it may never go vegan, that the most we can hope to accomplish in the meantime is to reduce the suffering of today's doomed animals. But this is not true. This is not a fact. It is a fear – a fear of action, a failure of will, a self- defeating attitude and, ultimately, a self-fulfilling prophesy. The truth is, the world can change. Indeed, the world has changed many times before, and it has changed in ways that seemed impossible at the time. The truth is, the world will change, but only if we work towards creating that change. It will stay the same if we, the self-proclaimed agents of change, encourage it to stay the same. It will change if all of us tell the whole truth that there is no such thing as humane animal farming, or animal use of any kind, the truth that the only humane alternative is vegan living, the truth that animal farming on any scale is an ethical and environmental disaster, the truth that animals are persons like you and me who happen to be nonhuman and who have the same inherent right to life and liberty as you and I. The truth that vegan living is not a "lifestyle choice", but a moral imperative. We can do better. Indeed, we have an obligation to do better. I invite you to see for yourselves how much can be accomplished when a small group of dedicated activists commits all of its time and resources to vegan education that is consistent with, not undermining of, our ultimate goal – Animal Liberation – and when the Go Vegan message is central to every single one of its communications, from online resources, to printed literature, to ads, demos, and billboards, to outreach events, to the in-depth exploration of farmed animal personhood detailed in the individual portraits published on the Prairie Blog. On a shoestring budget, with an all-volunteer core of vegan educators who are determined to tell the whole truth about meat, dairy and egg production, a small, grassroots organization like Peaceful Prairie Sanctuary has built something that large, wealthy organizations have not only failed to bring forth, but have consistently undermined through years of anti-vegan advocacy: A vibrant vegan world growing in the middle of the nonvegan world, a place where the animal refugees are regarded and represented as the persons they rightly are, a place where the human residents advocate tirelessly for nothing less than total liberation, a Free State in the heart of the human-subjugated world, a place where the principles of abolition are applied in word, thought, and deed. A vegan enclave whose very presence has already changed the world's physical, political, psychological and spiritual geography. I invite you to experience it for yourselves. Join us in our struggle to expand its reach. Help us make it borderless. Click image to learn more about the humane farming myth.